If you came here, you probably have been searching for something, which would refresh your old IKEA - TOMELILLA armchair. This piece of furniture remains the old-fashioned style, simply because of its curves - smooth, a little bit rounded surface and wedge arms, wide shape. Comfortable, but demanding at the same time, though - difficult to fit in a newer, more modern-like interiors. 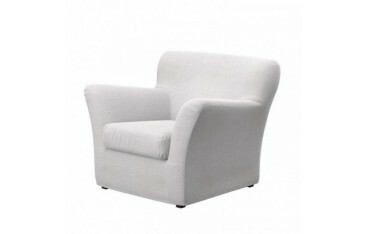 Thanks to our replacement slipcovers for IKEA - TOMELILLA armchairs you can easily change this old-fashioned, ponderous and a little inconvenient piece of furniture into something even more pleasurable to sit in, an armchair with a cool design, vibrant colour and pleasurable, smooth texture. All the features connected with matching the slipcover to the rest of your room you can adjust yourself, and in order to help you we can send samples of all the offered materials directly to your home. You can pay with bank traksfer, by card or paypal, and soon enjoy a new life given with this little decorative element to your interior.